Last week, while the Pres headed off to work (yes work...don't worry though...only PT for his brother), I headed to RI to spend the day with my daughter and Angel. It was one of those days...perfect, sunny, around 80 and a wonderful breeze making the beach PERFECT. What I didn't expect to see was a beach baby...not this late in the year. Yet there it was. Larger than Mom, it cried and carried on as Mom stood by watching and listening patiently. It hung around the small inlet and when the water rushed in, it would scurry around after fish. What I did observe was this. When Mom was around, it cried. When Mom wandered off, it's demeanor changed completely. It stood erect, rather than submissively, stopped crying and took care of itself. How lovely. I miss the gulls from when I used to live near the sea. I miss the sea! The gulls are not unlike human chuldren who can sometimes do the same, JP. Could be a "Mommy Dearest" Mom! I do believe My Shug and I could use some time at a beach. That's how human babies act too...even the 40 year old ones....sigh. That looks like a fabulous day! And the baby, what riot! Funny how those baby birds seem to need "tough love" to go out on their own. I see the same thing around my feeders. Glad you had such a lovely beach day! That is so funny! It needs to be independent, but wants it's mom. I know the babies can get even bigger than the parents, too! Love the photos that make up this mosaic. I would love to get another beach day in this summer before it's over. "It stood erect, rather than submissively, stopped crying and took care of itself. " - love when my teens do that. Enjoyed looking at the sea scenes. Delores shared my thoughts. 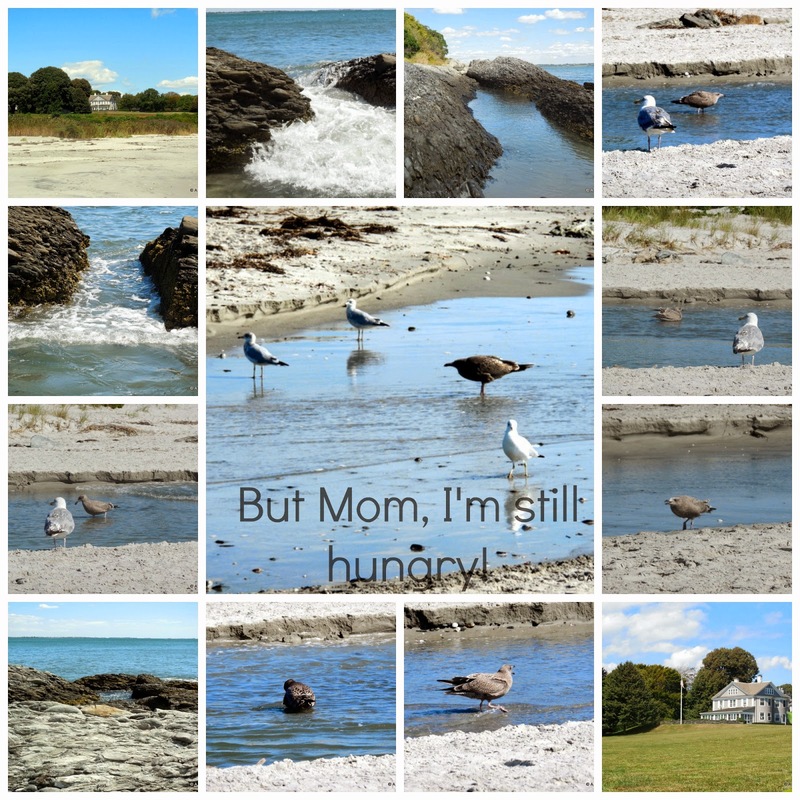 Lovely beach photos and birds too. Wonderful mosaic. I don't think I've ever seen a baby gull before. Hungry little fellow for sure and oh the surf there looked magical. I miss going to the beach. These are wonderful photos! Love to see the beach and all those birds! The three "B's" .... beach, birds and bellyaching. I love the beach. I enjoyed looking at your lovely photographs. Being hungry and crying about it happens to humans and birds. Alas. Awww - what great shots. Such a lovely place! Neat to see a begging baby still.